Village Montessori School is proud to be a fully recognized Association Montessori Internationale (AMI) School. AMI was formed in 1929 by Dr. Maria Montessori to ensure that her philosophy and approach to education would be carried on as she intended. Dr. Montessori’s goal was to foster the full development of the human being. A school or teacher training program that carries the AMI name is continuing the tradition of quality first established by Dr. Montessori, a tradition that incorporates standards based directly on Dr. Montessori’s work. Learn more about AMI school standards here. Our Education Director, Patricia Craft-Heuer, is a certified AMI school consultant. VMS is accredited by SACS/CASI - The Southern Association of Colleges and Schools. It is one of the six regional accreditation organizations recognized by the United States Department of Education and the Council for Higher Education Accreditation. This agency accredits over 13,000 public and private educational institutions ranging from preschool to college level in the Southern United States. Our Toddler and Primary Programs are certified by Bright From the Start - Georgia Department of Early Childcare and Learning (BFTS). BFTS is responsible for meeting the child care and early education needs of Georgia’s children and their families. It administers the nationally recognized Georgia’s Pre-K Program, licenses child care centers and home-based child care, administers Georgia's Childcare and Parent Services (CAPS) program, federal nutrition programs, and manages Quality Rated, Georgia’s community powered child care rating system. Village Montessori School’s fundamental philosophy is respect: respect for the child, the adult, the classroom, the school, and the Earth. Montessori educational methods are designed to foster independence, critical thinking, perseverance, self-discipline and self-direction, as well as to promote order, organization and the development of responsibility. 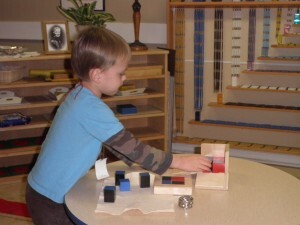 Montessori education enhances a child’s self-confidence. The child’s natural curiosity is observed and nurtured, creating a love of learning. Montessori believed the mission of the teacher was to prepare a child oriented environment and observe each child’s natural tendencies. The child is allowed freedom within this prepared environment to follow those innate tendencies along the natural path of development. Individualized instruction allows the teacher to meet each child’s needs at her own level of development or interest. 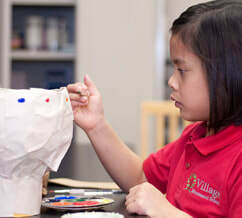 Village Montessori School’s child-oriented environment offers exercises in practical life, exploration and refinement of the senses, instruction and exploration of language, mathematics, geography, history and science. Daily activities include creative experiences in art and music, as well as art and music appreciation. Montessori classes employ individualized instruction of sequenced academics guided by each child’s own developmental process. The use of multi-age classes is a critical element of Montessori education. We also offer summer programs and extra-curricular activities. ​Research indicates achievement rates of children educated using Montessori methods are two to three times those of their peers. They also exhibit an increase in higher cognitive skills and interpersonal skills. The latest research on brain development reveals the brain is not fully formed until age 16. Researchers suggest appropriate early stimulation can raise intellectual functioning, as measured by I.Q. scores, by as much as 20 percent. Montessori education capitalizes on the important early years by introducing meaningful learning experiences that positively impact brain development and thereby have a lasting effect. Successful completion of the Montessori Primary program amply prepares the child for the challenges ahead in first grade and beyond. The Elementary curriculum encompasses all subjects – language, mathematics, geometry, botany, zoology, geography, the physical sciences, and the arts — in lessons that allow for open-ended, unlimited exploration in areas of specific interest to the child. VMS has a dynamic Parent Association that supports all school and community service activities. VMS has Master’s level teachers at every level of development, Toddler through Upper Elementary. Meet our staff here. VMS has experienced teachers who, year after year, choose to practice their craft at VMS. The longevity of teachers and assistants is a testament to their commitment to our community. Caring, dedicated teachers become part of your family. VMS is accredited by Association Montessori International (AMI), an internationally recognized organization with rigorous Montessori standards. AMI/USA consultants evaluate the school, classrooms, and staff every three years for AMI accreditation. Dr. Montessori’s discoveries about child development and how children learn best has become a proven curriculum for children all over the world. 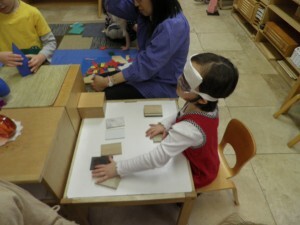 The continuum of curriculum from 18 months to twelve years old completes the student’s Montessori education. VMS graduates possess the tools to be socially and emotionally successful. VMS students consistently score well above national norms on standardized testing. VMS graduates are accepted at their choice of private high schools. Each child’s education is individualized. Lessons are presented to one child or a small group. Social skills and conflict resolution are balanced with academic achievement. Children work at their own pace, moving forward upon mastery of skills. Mixed age groups allow students to be role models and mentors. Students learn to evaluate and recognize their own progress. VMS has been a part of the Roswell community since 1995. 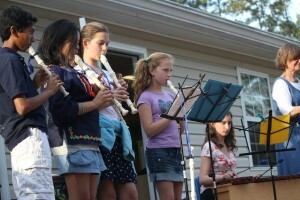 VMS has set a standard for quality Montessori Education in North Metro Atlanta. VMS is proud to partner with our local government, businesses, and charities. Giving back to others is one of our core values that we instill in our students.